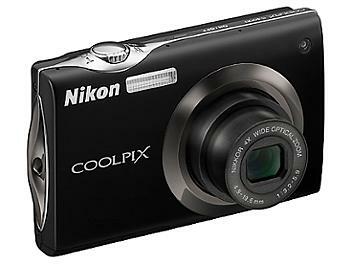 The COOLPIX S4000 with advanced operations and high performance in a slim, stylish design available in a variety of colors . The new cameras offer improved shooting functions for greater convenience, and the slim body has a high-quality design available in a variety of colors to suit individual preferences and style. The COOLPIX S4000 is equipped with a high-resolution 3-in., approximately 460k-dot touch panel TFT LCD monitor that offers intuitive operation. Monitor visibility has been increased for clear display of more details. The extremely practical operational controls have been inherited from its predecessor, and new touch panel functions including touch shutter and slider adjustment of white balance have been included. The new graphical user interface (GUI) makes for clearer display and improved operation. This comprehensive model offers all basic camera functions, as well as support for more advanced features such as HD movie recording, making it extremely practical. It is a stylish model that proposes a more quality camera lifestyle for those who are sensitive to the latest trends.